Striker Guinan began his career as a trainee with Nottingham Forest, but made just nine appearances despite spending seven years with the club. 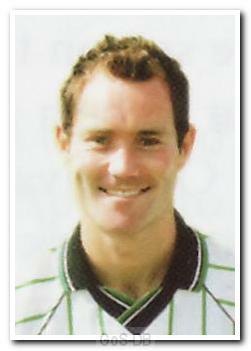 Whilst at the City Ground he moved temporarily to the United States with Greensboro Dynamo of the USL Premier Development League and after returning had loan spells with Darlington, Burnley, Crewe Alexandra and Halifax Town before joining Argyle for the last six weeks of the 1998-99 season. 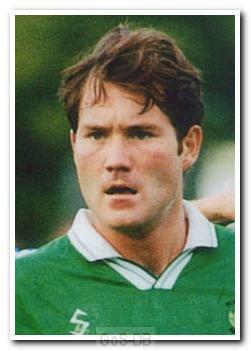 He was a great success at Home Park but returned to Nottingham before being loaned out to Scunthorpe United. Following his release by Forest, he signed for Cambridge United but was sacked for disciplinary reasons, which led to a return to Plymouth. However, he could not reproduce his earlier form and was completely out of the first team picture following the arrival of Paul Sturrock. After spending the best part of a season training with the youth team, he moved to Shrewsbury Town before joining non-league Hereford United in August 2002. He enjoyed the most successful period of his career over the following two years, scoring almost 40 goals for the club and being picked for the England National Game side. Returning to league football with Cheltenham Town in 2004 he helped the club gain promotion from League Two in 2006 before a return to Hereford, initially on loan, in 2007. Back at Edgar Street he helped the club win promotion to League One in 2008 before moving on to Northampton Town a year later.